UNITED NATIONS, Apr 11 2018 (IPS) - As global citizens face an array of issues from unemployment to discrimination, affecting their livelihoods and potential, a UN agency called upon businesses to employ a new, sustainable, and inclusive model that benefits all. 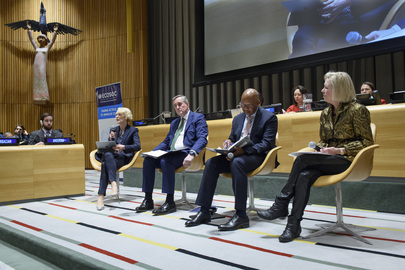 Business leaders from around the world convened at the United Nation’s 2018 Economic and Social Council (ECOSOC) partnership forum to hear how the private sector can work with governments to improve global economic opportunities. “The private sector is an indisputable partner in reducing global inequalities and improving employment opportunities for all” the UN Deputy Secretary-General Amina Mohammed told the audience. Mohammed stressed that the private sectors contribution to development was essential if the world is to meet the 2030 Sustainable Development Goals (SDGs). Instead, leaders were challenged to commit to align their business goals with the SDGs by investing in sustainable business models. “I would also like to take the opportunity to challenge the business leaders present here today to make bold commitments to a more inclusive future for all,” said Marie Chatardova, president of the ECOSOC. Chatardova reminded the leaders of the UN’s Business and Sustainable Development Commissions recent research that found that investment in sustainable models could create some $12 trillion dollars in economic opportunities by 2030. “Investing in sustainable development goals – it’s a ‘win-win partnership,” she said. Today, 192 million people are unemployed. Eight per cent of the global population live in poverty. There is a mounting youth unemployment crisis. Women, indigenous and disabled persons continue to face barriers to equitable and meaningful employment. Attendees highlighted the importance of sustainable business models that prioritize diversity and inclusivity by getting women, youth, indigenous and disabled persons into the workforce. In panel discussions, many business leaders spoke of their companies’ ongoing diversity programs. Sara Enright, director of the Global Impact Sourcing Coalition (GISC), pointed to Impact Sourcing – an example of inclusive business practice. The GISC is a global network of 40 business that include – Google, Microsoft, Aegis, and Bloomberg – that have committed to impact sourcing. In March, GISC members were challenged to hire and provide training to over 100,000 new workers by 2020. Enright said so far ten companies have responded to the challenge, pledging to hire over 12,000 workers across Kenya, Nepal, Cambodia and the United States. Enright said she expected many more companies to sign up and stressed that the GISC would monitor and measure the outcomes. The UN applauded GISC’s work as an inspiring example of the private sector working collaboratively and inclusively to meet the SDGs vision. Another issue that arose during the forum was corruption in development. Last year global development funding reached $143 trillion dollars, of which the UN estimates that over 30 percent of funds failed to reach their intended destinations. The UN told business leaders that if they commit to using technology that better tracks where money goes in development, then it will help curb corruption. Bob Wigley, chairman of UK Finance, encouraged businesses to invest in technologies like ‘Block Chain’. Block-chain, or Distributed Ledger Technology, is a digitized public record book of online transactions that was developed in 2008 with the rise of online currency ‘bitcoin’. It is an entirely decentralized means of record keeping, meaning it is operated on a peer-to-peer basis rather than one central authority. Wigley said the technology allows the direct tracking of online payments, ensuring that it is delivered correctly. “If I was the recipient of state aid or wanting to know where my funds are going exactly then I’d be using block-chain systems, not the antiquated bookkeeping that gives rise to potential corruption every time a payment trickles from one set of hands to another,” he said. “Think of how embracing and enhancing block chain technology could ensure accountability and transparency – things that are critical to meeting the SDGs,” Wigley continued. Whilst many businesses are committing to the SDGs and implementing sustainable initiatives, more still needs to be done to unlock the full potential of the sector. Kristine Cooper from United Kingdom insurance company Avia said it is a question of creating ‘competition’ between business by tracking them in their commitment and delivery. “Lots of companies are doing great things in diversity and SDG commitments and how they do business to meet these goals, but it’s hard to know who’s doing really well, there is no consistency with reporting,” Cooper said. Ranking companies and holding them accountable, Cooper said, would create a “race to the top” and in the process, truly unleash “the power of the corporate and private sector in meeting development goals”. Discussion points from this meeting will be further discussed in ECOSOC meetings held in May 2018, as well as at the High-level Political Forum on Sustainable Development in July 2018. I think that inclusion plays an important role in the International/Global employment market. As an example, we need to focus on those individuals who are disabled, those from extreme poor countries that needs their basic educational skills(reading, writing and speaking) to survive from extreme poverty, and the people of ancestral indigenous countries that needs better and modern technical tools, training, and technology to better their local agrarian industry.